If more poets wrote like Jack Ridl, more people would read poetry. Reading a collection of poems by Ridl, you feel as if you are sitting in his living room, or across the table at a bar, or roaming through a trail in the woods, just listening to him spin tales. The tales are not necessarily stories, although he does that as well. Like many great poets, Ridl tells tales which make us see exactly what he sees, but in a whole new way. I let my two dogs out every morning, but after “The Dogs’ Door Is at the Far End of the House,” I’ll never watch them go out the same way again. Like every dog owner, he watches them trudge into the morning heat or a drift of snow, day after day. One of elements of Rid’s poetry which differentiates him from other poets, is his humility. He is not trying to save the world through his poetry. He is not even trying to understand the world through his poetry. He is trying to live in the world through his poetry. As a result of this humble approach, he does indeed bring understanding and glimpses of salvation to all that is around us. Throughout his other works, and this one is no different, Ridl also displays a welcome sense of humor. You can almost see him standing off in the corner with a wry grin on his face, watching something unfold. In “My Wife Has Sent Me An Email,” we see a tender exchange of checking on the coffee supply at home and signing off with love. It is not a diatribe against the inhumanity of technology. It is someone chuckling to himself over his own use of it. His humor can be more straight forward, as in “‘Moose. Indian.’ –The last words of Henry David Thoreau,” where he rethinks what those words could be. into the light that falls after 4pm. This volume is longer than some of Ridl’s other collection, and the result is a fuller picture of his art and a greater context to reflect upon his work. It is divided into four sections, one of which, “Interlude: ‘Hey Skinny, the Circus is in Town’,” was published separately before as a chapbook. In the midst of these other poems, they take on a new color, which is why larger collections of poems are sometimes better than the one poem standing alone. They are likes songs on the albums of yesteryear, which we listened to because they were there and required attention. Those songs could stand alone, but they take on a new sound when listened within an album. Poetry can work in the same way, and Ridl’s book is stronger because of its depth. The sections reflect different ideas. The first section, “From Our House to Your House,” is a return to his childhood, and especially seeking a connection with his father. In “The Enormous Mystery of Couples,” he looks at relationships of different types. The final section, “The Hidden Permutations of Sorrow,” focuses not simply on sorrow, but really, the hidden permutations of life. Perhaps Ridl succeeds because he writes for everyone. The opening poem is “Write to Your Unknown Friends,” so Ridl brings to life many of his unknown friends. Tanya, the single mom with three kids working at the post office. Ted, who sells cars and wishes those with fins were back in style. Ann, with the best perennial garden in town, who wears a hat wherever she goes. In other words, Ridl is writing to everyone, not just other poets. He has done this throughout his career; in this volume, he excels at it. 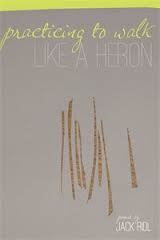 This entry was posted in Poetry and tagged jack ridl, poetry, practicing to walk like a heron by derekemerson. Bookmark the permalink.